Introduction (G. Rickheit, C. Habel). Part I: Fundamentals of Mental Models: Mental models. Some answers, some questions, some suggestions (G. Rickheit, L. Sichelschmidt). What's in a mental model? (A. Garnham). What are mental models made of? (A.J. Sanford, L.M. Moxey). Why mental models must be embodied (A. Glenberg). Part II: Mental Models in Discourse Processing. Taking the functional aspect of mental models as a starting point for studying discourse comprehension (B. Kaup et al.). Cognitive aspects of coordination processes (G. Rickheit, H. Wrobel). Task-dependent construction of mental models as a basis for conceptual change (W. Schnotz, A. Preu&bgr;). Grounding mental models – subconceptual dynamics in the resolution of linguistic reference in discourse (K. Kessler et al.). On the duality and on the integration of propositional and spatial representations (C. Freksa, T. Barkowsky). Cognitive modelling of vision and speech understanding (B. Hildebrandt et al.). Part III: Mental Models in Reasoning and Problem Solving. Mental models of spatial relations and transformations from language (B. Tversky et al.). A semantics for model-based spatial reasoning (J. Glasgow, A. Malton). 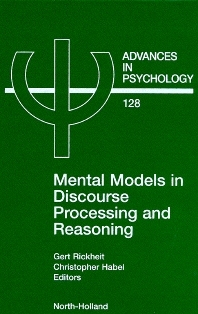 Mental models in deductive, modal, and probabilistic reasoning (P. Tabossi et al.). The construction of preferred mental models in reasoning with interval relations (C. Schlieder). Parts and wholes and their relations (S. Pribbenow). Concessives and mental models (R. Klabunde). Authors. Author index. Subject index. In this interdisciplinary discussion on mental models, researchers from various areas in cognitive science tackle the following questions: What is a mental model? What are the prospects and limitations in applying the mental model notion in cognitive science? How can the ideas on the nature of mental models and their mode of operation be empirically substantiated? The primary goal of the research group was to work out a definition of mental models that embraces the overall use of this construct in cognitive science as well as the more specific conceptions used in particular research domains such as cognitive linguistics. Theoretical claims about the properties of mental models were discussed and their tenability evaluated against the empirical evidence. The volume is divided into three parts. Fundamental aspects of mental models are presented in the first section, the following part contains contributions to the function of mental models in discourse processing, and finally problems of mental models in reasoning and problem solving are outlined. For all those working in the linguistics, psycholinguistics, psychology, cognitive science, informatics, philosophy and artifical intelligence fields. Fakultät für Linguistik und Literaturwissenschaft, Universität Bielefeld, Postfach 10 01 31, Bielefeld, Germany. Arbeitsbereich WSV, Fachbereich Informatik, Universität Hamburg, Vogt-Kölln-Stra&bgr;e 30, 22527 Hamburg, Germany.